Those are MPIRICA Quality Scores for a single facility in New York. Proponents of facility-level data would try to persuade you that if a hospital excels in one service, it excels at them all. Clearly, that’s not the case. Dr. Jha underscored this point in his editorial. He cited a landmark study of performance variation in a single hospital. Another study showed that the variance runs deeper than that. Even on the fundamental skills, like incisions or suturing, all surgeons are not created equal. All of this points to a clear conclusion — if you want good outcomes, it matters who holds the knife. So don’t settle for facility-level data. Dr. Jha pointed out that the most important surgical decision is also the first one: whether to do the surgery in the first place. With facility-level data, it’s not possible to see who chose to take a case on. That leaves no way to tell whether a surgeon has a good sense for appropriateness of care. Surgeons who object to individual performance ratings raise at least one valid point: that surgery these days is a team sport. Even the very best surgeons would agree with that. So perhaps it’s unfair to rate surgeons by themselves, when the entire surgical team shares responsibility for outcomes. Dr. Jha disagrees. Although, yes, anesthesiologists, nurses, surgical techs and others all have a hand in the procedure, there’s no doubt about who actually runs the show. The buck stops with the surgeon. The American College of Surgeons’ Statement on Principles Underlying Perioperative Responsibility makes this clear. “The surgeon is responsible for the safe and competent performance of the operation,” including coordinating the team and bringing their efforts into concert for the patients’ health. The surgeon’s Quality Score, then, is a proxy for the entire surgical team’s. Rate the surgeon, and you effectively rate everyone else in the room. Finally, perhaps the best case for individual surgeon data is also the simplest. It’s what patients want. As Dr. Jha put it, “When people seek advice on where to go for surgical care, they ask about the best surgeon for them.” It’s not useful or accurate to tell patients that they should focus on choosing the right hospital. The evidence proves this isn’t the case. Moreover, that position betrays a lack of empathy. Patients going through surgery often feel anxious and afraid. Institutional bona fides will never be enough to soothe that anxiety. In the end, for their peace of mind, they’ll need to trust the person behind the surgical mask. 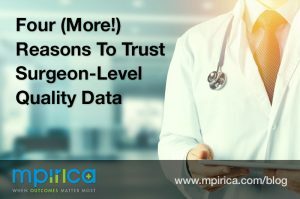 Surgeon-level data inspires that trust. Facility-level data cannot. Do we need a better argument than that?